My heart sank when I saw the weather forecast. It’s silly because of course the weather is something we can’t control (except for the fact that it made me pack my warm Hoka hat…which in retrospect I’m very glad I did) and to worry about it only made me unnecessarily cranky. Anything but a headwind! I cringed at the thought of a cold and wet breeze hampering my pace. Thinking back to my days as an aspiring mechanical/aerospace engineering student at Cornell (a program I quit after 1 year) I remember calculating drag coefficients and how wind speed resulted in exponential relations. In other words, the faster you go the more of an influence wind has at an alarmingly increasing rate. Running close to 5min/mile (12mph), straight into a 13 mph (projected) headwind would result in what would feel like a 25mph wind! Any other day the entire week in Boston would’ve been a “faster” day to run the marathon! I became quite discouraged and spiraled into a negative thought cycle. The “weather excuse” had been played out over and over in my mind in the final few days leading into Marathon Monday. But the night before the race I had to pinch myself… I had to remind myself that I was in Boston to still run my very best race possible and also place as well as possible. 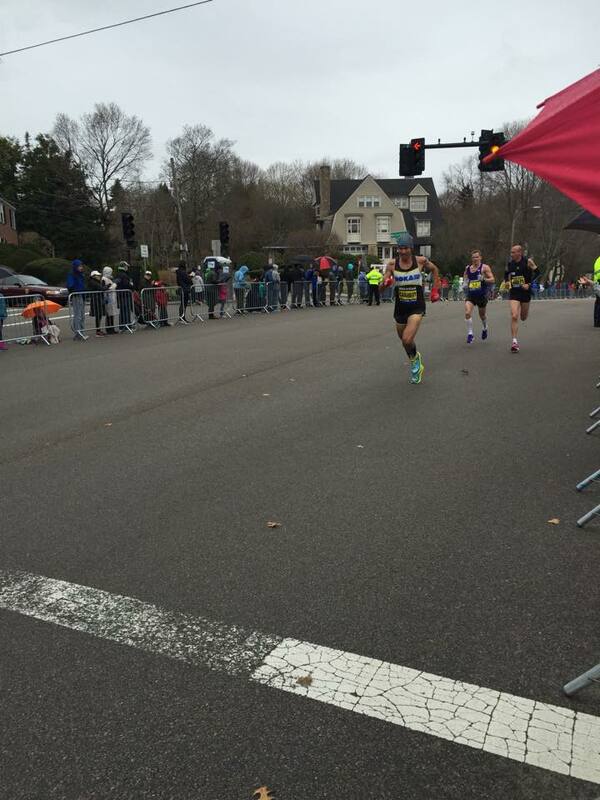 It appeared that going for an Olympic Trials marathon time (sub 2:18:00) was going to be a long shot goal if the wind was blowing head-on at us at over 10-15mph for most of the race. I decided that the only thing to do was “play it by ear.” I’d have to respond to weather and how I felt on the fly…I had to be flexible to execute my ideal race. I forgot to add my trusty COMPRESSPORT USA Calf Sleeves to this pic! Head to CompressportUSA.com and enter PROMO CODE: SAGE15 for 10% off your order! Thanks for your support Compressport!!! Knowing from my prior experience at Boston (ironically an epic blow-up on a perfect weather conditions day in 2010 when I wasn’t coaching myself) things really start to get real in the Newton hills. Actually in any marathon things get real around mile 20 as how I feel there (usually on the edge of blowing a gasket if it hasn’t happened already) usually determines whether or not the race is going to be an epic melt-down or a “slow fade into the wall” (the latter of course being much more of an ideal race with relatively even mile splits). I could only wait and see based on my sensory data and prior knowledge what kind of pace I might be able to sustain when I reached that point on the course. Hope. I felt hope right before the start in Hopkinton. There was news that perhaps the wind and rain was coming in a bit later in the day. I thought to myself…gaining confidence that my attempted goal of averaging 5:15 mile pace for an Olympic Trials Qualifying time could still be attainable for me! I was going for an OTQ time! I was lucky to toe the line right up front! As we settled in for the first 5km or so (16:08) a large gap formed between us and the real elite lead pack. I got antsy with the mile splits as running in a pack with 20 or so guys seemed to be inconsistent and things started to slow down. We had some 5:18 and 5:20ish mile splits in there. I figured with the substantial downhills early on that 5:10s would be much better to hit to even have a shot at a sub 2:18:00 (5:15 average mile pace). Forge forward solo into the wind and try to catch a “pack” of 2 guys that I saw about 300m in front of me. Sit back with a “safer pack” of 15 or so guys who could help shelter some of the burden from the wind. I went with my first choice and I’m glad a did as it ended up probably being my most decisive move of the entire race. Leaning into the wind as the course opened up heading towards Wellesly I recorded my halfway split at 1:08:38. About exactly what I wanted, but it didn’t feel very good! The noticeable gusts of wind bothered me and I ran solo (with gaps of about 200m in front and behind me) for the next 5 miles towards Newton. 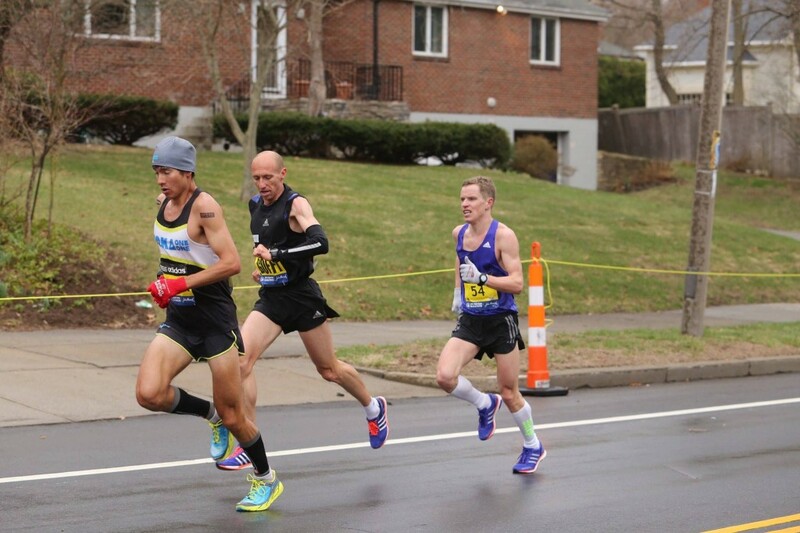 Coming into the infamous Newton Hills I finally caught two foreign runners Danilo Goffi ( a former 2:08 marathoner who placed 9th at the Olympic Games in 1996, but was now competing as a 42-year old masters runner for Italy!) and Sergey Zyryanov (I couldn’t find much about him, but he was from Russia and ran really tough!). As we tackled the Newton hills …Danilo would amazingly surge on the uphills and gap us, while Sergey would come flying back on the downhills. It was a free-for-all competing for place at this point though, so helping each other with drafting against the wind wasn’t really happening all too much! 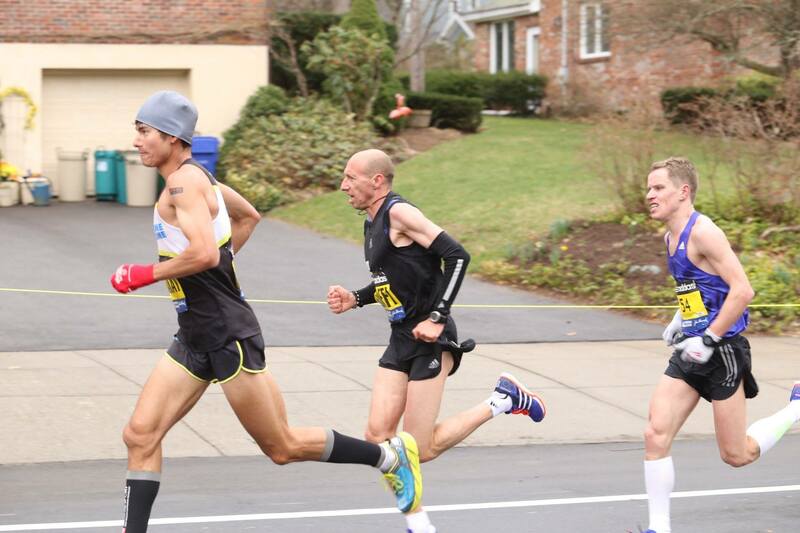 Near Heartbreak hill at mile 20 I felt my time goal slipping away as I thrashed my arms to get my stiff legs moving. My stride rate slowed. The cold wind and rain pounded us as the threat of cramping, hypoglecima and hypothermia sunk in. Pain clenched my entire body like a vice clamp slowly tigntening its tortuous grip. As I popped my 4th Vfuel gel, I tried to regain mental focus as my body was starting to crumble. I thought about how funny it was that I was still wearing my warm HOKA hat as I had never warmed-up enough to chuck it to the crowd (like I had assumed I would’ve much earlier)! 1:45:10. I came through 20 miles exactly 10 seconds off my goal pace. It was the first time I had been behind pace all day and I had a gut feeling that getting back ahead of pace was likely not going to be a reality in the last 10km of the race. My legs were on edge, and even despite running a bit with Danilo and Sergey, the wind was making 5:20 miles feel wickedly hard. Over the final miles we moved up in place as many from the lead pack had seemingly dropped out. I had no idea what place I was in until about mile 23 when a spectator yelled out I was in 16th. By then Danilo had pulled away convincingly and Sergey was right behind me. We ended up finishing exactly in that order. When I hit the final stretch heading onto Bolyston street and amid the ultra-supportive crowds that had braved the cold wind and rain I saw the finish banner about 385 yards away. Just then I [painfully] saw the clock click past 2:18:00. After mustering up a weak kick I finally finished in 2:19:12. 72 seconds off my goal, but in 16th place overall. In hindsight my experience in Boston was very positive. It was my best placing in a world marathon majors race (besting my 17th place at Chicago in 2010), and a much better improvement from my prior Boston performance (a 2:24 on a perfect weather day in 2010 where I totally blew a gasket). I ran the race I wanted to in terms of strategy, tactics and pacing and the effort wasn’t a horrible positive split or complete bonk (like many of my marathons have been). I will admit though that it was a little bittersweet to miss my goal of qualifying for the US Olympic Trials for the second time in 6 weeks. I went for it, held nothing back, and came up a little bit short. I will try again though! (the qualifying window is open until January 17th, 2016). Right now it’s all about regrouping, recovering, and cranking up the mileage again for my first road ultra (that just happens to be the largest and most competitive ultra marathon in the world): Comrades! Again, thanks so much for following along on this journey. I really appreciate all your support, feedback, kind words! I hope your running is going well and I wish you the best of luck in any future events/races you may have coming up. PS I’m helping raise funds for the charity Team World Vision South Africa as part of my Comrades marathon build-up. The charity helps provide clean drinking water and food for children in need and I have a goal of raising at least 8,000R (about $650 USD) We’re almost 50% of the way there so far with nearly 4,000R raised! Thank you! I’m also proud to announce that 65% of all proceeds from my film sales of “MUT Runner” (available for digital download HERE) will be going directly to this fundraising goal as well. Any support would be much appreciated!! 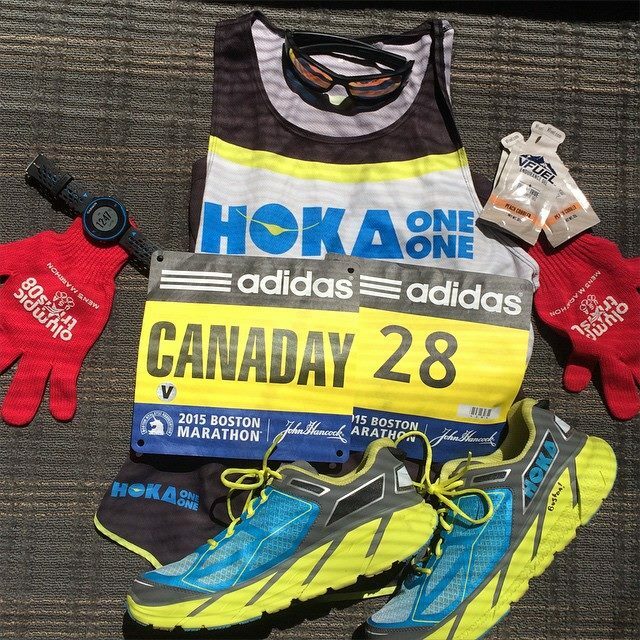 For Boston I used/wore the following gear and products. Socks: Drymax max protection = no blisters after the race! Nutrition: 5 Vfuel gels during the race (peach cobbler flavor) = no bonk and no stomach issues! For day-to-day Training: 2 Tablespoons of Flora Health “7-Sources” oil as an Omega-3 source. Fluid/Hydration/Camera Carrying gear for filming and some training: Ultimate Direction packs! Training Log/Workout recording: Strava.com and a Garmin 620 GPS. All my training is recorded and posted on Strava! Great job Sage!!! You’re an inspiration! Great race on Monday. It’s disappointing to not hit our goals, but there’s not much to be done about weather. I noticed you ended your race recap mentioning you running Comrades and raising money for Team World Vision. I love that as I went to run Comrades back in 2010 with Team World Vision, the first time they went there. Josh Cox and Bart Yasso were a part of our team. You couldn’t be helping a greater organization. I spent a week after the race visiting some of the work they do, and one of the girls my family sponsors. Quite impressive and moving. Anyways, just thought Id say thanks for giving back, and using your gifts to bless others. Take care, recover well, and keep your head up! Hey that is so awesome to hear…really happy to be helping out a cause that is so thoughtful. That sounds like an amazing experience. Thanks for the support! That was a great read Sage and I’m really gutted for you on missing out on your 2hr 18m target , but you will do it given the right conditions and race . You are a big inspiration to a lot of us who are nowhere near as quick as yourself and your videos are simply great (I watch them all) so for you as an elite athlete to take the time to help others like myself learn more about running and the non running side of it (nutrition etc) you deserve a lot of credit , well done Sage and keep it up you will make that time , we all who follow you know you will !!! Hey thanks so much Carl – glad you like the videos and following along. Stay tuned for more and best of luck with your own training/racing! Thanks for the race report Sage! Rare but it makes me want to run on the road again 😉 You should try Philly. PR’d there and some friend to. Fast course. Hi Richard, thanks for letting me know about Philly…for sure considering it now! Best of luck with your running as well! No reason to be discouraged, Sage. A SUPER effort! You’re a great inspiration, for sure. BTW: You’re selling me on Hoka’s! Clifton’s coming next week! Great to hear! 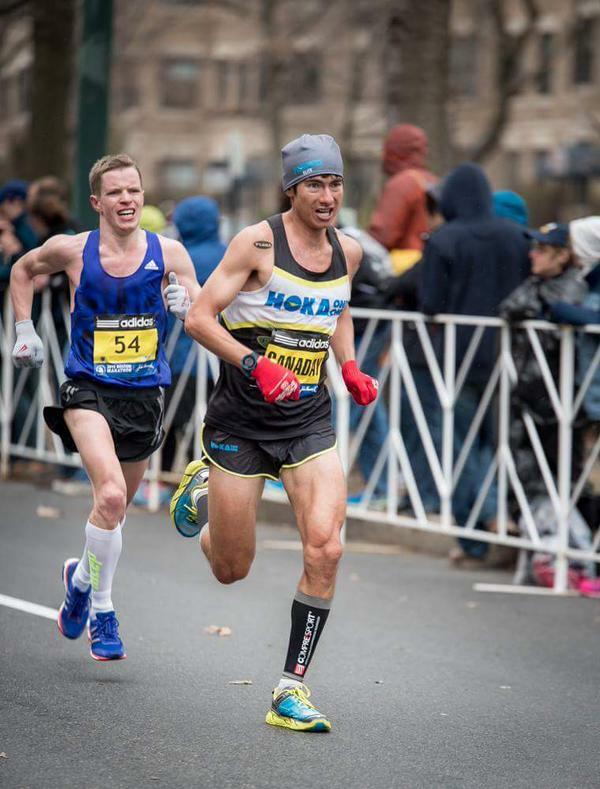 Hope you love the Hoka Cliftons as much as I do! Great job Sage! You are inspirational! Congrats Sage! It was fun to watch you virtually by your splits amongst many other friends of mine on that day. Still a remarkable effort you have put in on the pavement with two amazing marathons. Keep up the great work! Hey Scott thanks so much for following along…I really appreciate your support! Hope you qualify for Olympic Trials! Hi Paulo, thank you very much!! Hey Sage – I know you didn’t hit your goal, but your determination and performance is still inspiring. Good luck at Comrades. It would be great to see an American win at that race again! Hey thanks so much for the support! I’ll try my best at Comrades! I’m pretty sure I did hear your yell! Thanks so much for the support. Best of luck with your recovery and next race too! Really impressive race Sage, and only 72 seconds off your goal despite the vicious winds and laws of physics. I think it’s hard for some people to appreciate how hard it is to run at that pace, let alone for 26 miles. Well done, and I know we’re all looking forward to seeing how your summer goes! Hey thanks so much for the support Stew! Thanks for sharing Sage – very interesting to read how an elite progresses through different stages in a marathon, looks like even at that level you always have the ‘I may be running out of gas’ in the back of your mind. Can’t wait to see how your ultra season unfolds. Amazing how you can keep up this type of road performance and excel in the ultra distance as well. Thank you! Glad you liked the report. Yeah, marathon pace isn’t getting any easier…there is always a danger of bonking early if one is pushing themselves 100%. Best of luck with your training as well. Sage! I came out Monday to cheer you on on Heartbreak Hill and couldn’t be prouder. You have inspired me so much and appreciate your tips and training videos. I have been running in hoka’s for over a year now in the bondi’s and just picked up the challengers to try out some trail running and will be getting the Clifton’s next week for the road. Thank you for always staying positive and uplifting. I will be training for my first marathon this fall and will continue to follow and support your journey to OTQ. Best of luck! Thanks for being out there in the cold wind and rain! Great to hear you love the HOKAs – they’ve been treating me well on the roads and trails. Best of luck with your future events and thanks again! Congrats on an awesome run! So close to 2:18, I have no doubt you will get it before Jan 2016. Such a great race report also. Best of luck at Comrades. I will be cheering you on from the back of the field! Thank you! Best of of luck with your Comrades training – see you out there! It doesn’t. Any IAAF cert. course. I would love to do Berlin, but it’s likely I will not be recovered enough from the UTMB100 (late August). I’m looking at Frankfurt though! Thanks again and best of luck with your running. Nice race all things considered. I met you on Newbury Street on Sunday briefly while you were presumably out for a shakeout run. Tough day out there. I was prepped and ready to hit 2:57 or so, but like you, fell off pace a bit through Newton and couldn’t get it back. Finished in 3:03, which is a new PR, so I’m not allowed to complain…but I’d like to 🙂 Also, like you, I was fretting and obsessing a bit about the weather forecast all weekend, which happened to be gorgeous, and finally on race morning I reassessed and relished in the fact I was about to race the oldest and most storied marathon in the world for the second year in a row. It’s an honor just to be a part of it, and ambassadors such as yourself and Meb and others do our sport proud. We will go o to fight another day. I will get my sub-3 and you will get your OTQ. Perhaps the Portland Marathon on Oct. 4? Seems like that could potentially set up nicely in your quest. Good luck in Comrades. Potential throw down between you and Max? Another Oregon boy, as am I. Hey great seeing you out there! 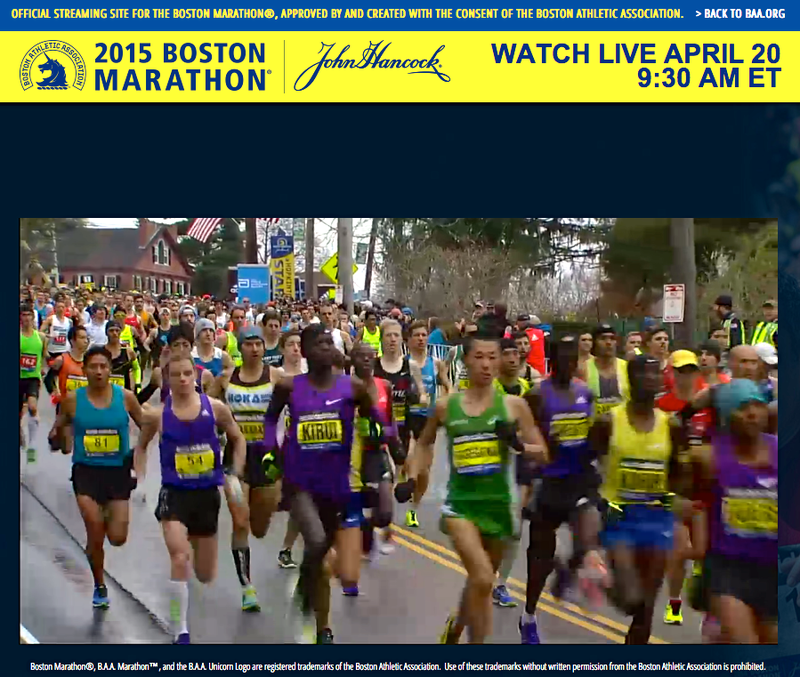 Congrats on the PR….that is very impressive and it sounds like you had a great Boston experience. You’ll get that sub 3 in no time! I think Portland isn’t the easiest course, but I’m sure you could probably go sub 3 there as long as the weather isn’t as rough as it was in Boston! Best of luck and thanks again. great job. Been following you on your vo2maxprodutions youtube channel, you’ve been of great help! I’m really sorry you didn’t make it in the time you desired. Keep on pushing (and posting)! Thank you for your support! Glad you like the youtube videos on Vo2max Productions. Stay tuned for more! Thanks! I’m looking at Frankfurt right now as it is a better time after the UTMB100 (late August). I’d love to come visit Germany! Congratulations on the very powerful run and the finish. What a run from you. Can’t say enough. I want to add that what a good writer you are, it was really nice going through it a few times. I am pretty sure you will make it on a favorable day. 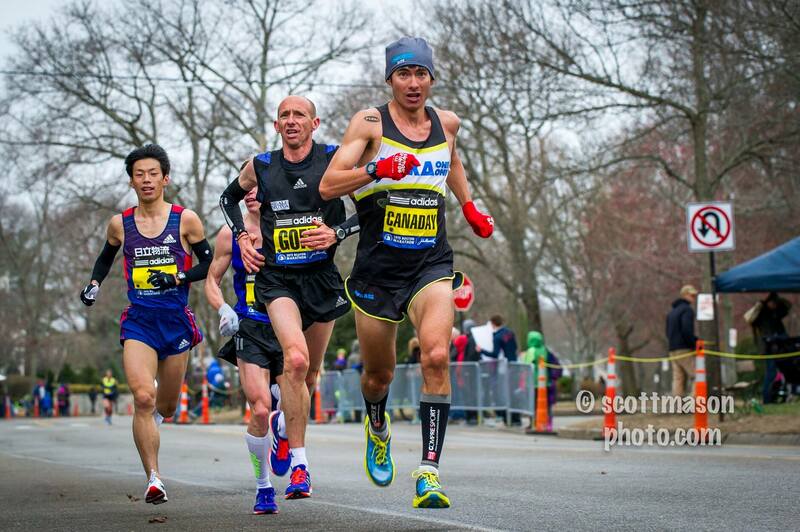 You ate kind of closing the gap between you and Ritz/Meb . As other said you are ready for 2:15 time. Please keep the videos and blog going. It is inspiring as well as fun to watch. Best of luck for Comrade and utmb. Hotly excited to see you run UTMB. Hi thanks so much Binay! And thanks for your donation to World Vision South Africa! I really appreciate your kind words and encouragement. hey I just saw that now…I can’t change what you wrote but it is a pretty small typo so no worries (you might be able to fix it now that it is posted though). Thank you again!! Sage, you did great! You and Sandi are both so inspiring! I ran my first 50k today and used y’all’s blogs and YouTube videos for training tips and motivation. I think I might be hooked on trail running now. Congrats on your awesome time at Boston! Hey thanks so much Kristen! Congrats on the 50km…that is really great you like the trails now! Best of luck with your training and future races and thanks again for the support! Your did Spectacular in this race, despite the adverse weather conditions. Lots of lessons to be learned and now is the time to regroup and prepare for your future races. Some suggestions for the legs, Add some Magnesium oil spray on your legs the night before to rest the legs, and the morning of the race. (it can be mixed with some lotion) You can also do it post race to lessen the swelling too. Also, Drink some baking soda,helps to lower the acid build up in the muscles, practice with it so your stomach gets used to it, start at a teaspoon 30-45 mins before a hard run/workout. Lastly, I love Vfuel and use it as well, but I also take some branched chain amino acids before the race and also add some to my water if running over 1/2 marathon distance and any trail ultra. Enjoy watching your Vo2max production videos and all the other stuff you put our there, great stuff you do for the Ultra community. Run safe, stay strong, smile and have Fun. thanks so much for your support and comment! I’ve actually tired taking baking soda (once in high school) and almost threw-up…very upset stomach. I figure for marathons and ultras lactate build-up and acidic ph levels aren’t a limiting factor like in the shorter distances. I also take Magnesium supplements (pills) as I was tested once and was in fact low…does cause muscle-coordination problems. Glad yo hear you like the Vfuel too. Hey Sage, You ran a gutsy race! You made a bold move to take off from the pack and you held on very strong. That 2:19 is worth a lot more. When is your next race? I’m thinking of going to to CIM. How much do you think weather afffected your race? Hey thanks so much! Great to hear you like the HOKAs. I like both the Clifton and the Huaka, but the Clifton is a little lighter and the softer cushion felt better with the big downhills at Boston! « SAGE RUNNING™: Podcast #6: The SECRET to running faster at all distances!